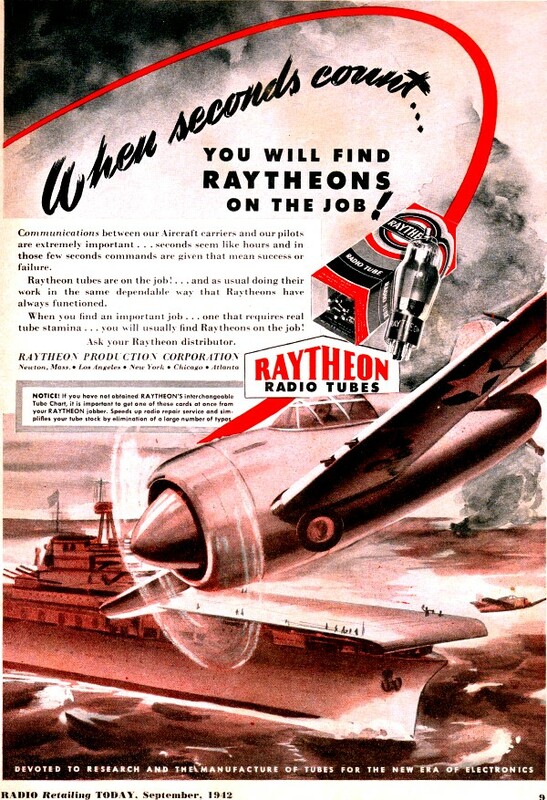 I love these old electronics company advertisements from the World War II era. It represented a time when minor differences between citizens were put aside for the good of the country (yours and mine). Nationalism had not yet been redefined by one-worlders to mean that you hated the rest of the world, but rather that you had pride in your country of birth - or legally adopted new country - and were willing to sacrifice for the common good to preserve your way of life. The U.S. and Great Britain were indisputably the leaders in technical invention amongst the Allied powers. Germany and Japan led the Axis powers tech realm. That's not to say others didn't contribute and were not vital to success. Naval aviation represents to me the assimilation of all great technologies inclusive of ships, aircraft, electronics, weaponry, communications, strategy, discipline, community living, isolation, navigation, and maintenance - all in a limited space. Seeing the "When seconds count..." opening to the ad reminds me of a saying oft repeated by advocates of firearms for self protection: "When seconds count... the police are just minutes away." When seconds count... You Will Find Raytheons On The Job! Communications between our Aircraft carriers and our pilots are extremely important ... seconds seem like hours and in those few seconds commands are given that mean success or failure. 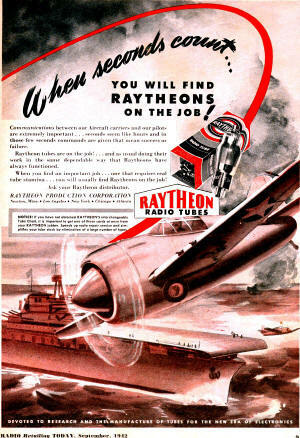 Raytheon tubes are on the job! ... and as usual doing their work in the same dependable way that Raytheons have always functioned. When you find an important job ... one that requires real tube stamina ... you will usually find Raytheons on the job! Notice! If you have not obtained Raytheon's interchangeable Tube Chart, it is important to get one of these cards at once from your Raytheon jobber. 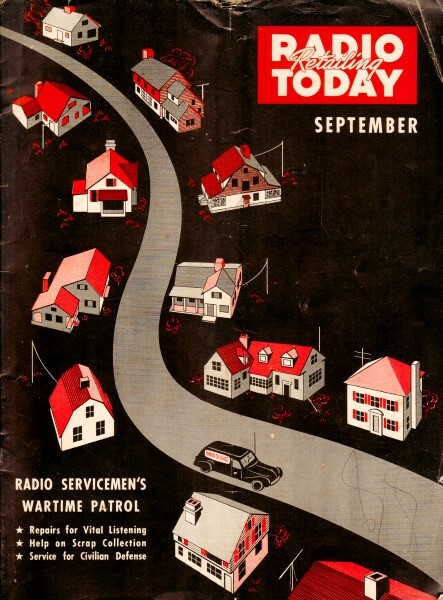 Speeds up radio repair service and simplifies your tube stock by elimination of a large number of types.